Christmas TV Party: Daniel Budnik at Some Polish American Guy Reviews Things and co-author of book Bleeding Skull. I spent some time thinking this one over. To my surprise, I think it’s Santa Claus Conquers the Martians. And, that is completely accidental. I first watched it around 1986. I taped a copy (on Beta) off of a 4AM showing and watched it several times that Christmas season. Since then, I have watched it at least once a year. But… in 1991, Mystery Science Theater 3000 aired an episode where they watched it. So, I watch that every year and the movie without MST involved. That’s a lot of viewings. But… in 2008, Cinematic Titanic released a DVD where they riffed on it. I watch that every year. So, for the past seven years, I’ve watched it at least three times a year. And, since I got the movie on Blu-Ray a few years ago, I watch it even more. As I said, Purely Accidental. Apparently Droppo visits my living room more often than Rudolph. As a kid, I generally zoned out when songs started up on Christmas specials. But, one song-filled special I did enjoy very much was A Claymation Christmas Celebration from 1987. Very funny, rather weird and each segment had something a little different. Variety performance? That would be John Candy as Divine singing “Santa, Bring My Baby Back To Me” in the SCTV Staff Christmas Party episode. Holiday song in a movie? “We Need a little Christmas” from Mame. During the hottest times of the year, I find myself whistling this song a lot. In fact, I’m whistling it now. If I’m in a melancholy mood and don’t want to be lifted out of it, the song in my heart is “Christmastime in Hoboville” from The Last of the American Hoboes. Plus, as far as musical Christmas stuff goes… there is a wonderful 1964 LP called A Merry Monster Christmas by Len Maxwell. It’s a series of sketches and songs with monsters celebrating Christmas. And it is fantastic! The songs are good and the sketches are pretty darn funny. I recommend finding it and giving it a listen. 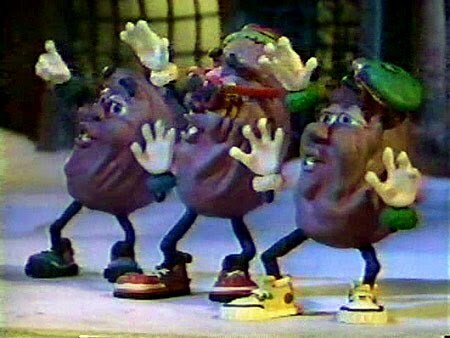 The California Raisins sing "Rudolph the Red Nosed Reindeer" in 1987's A Claymation Christmas Celebration. I’m going to go with the Doctor Who episode A Christmas Carol. A crotchety old man who owns the sky on a distant planet won’t open up said sky to allow an out-of-control spacecraft to make a safe landing on Christmas Eve. The Doctor must re-shape the old guy’s past to make him a better man. 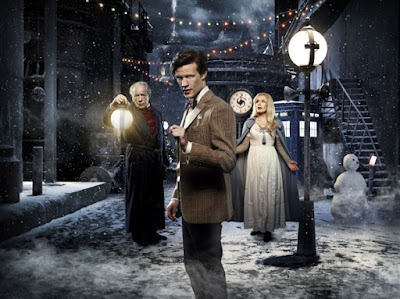 Our Favorite Time Lord gets some help from the “Ghost” of Christmas Present and the Surprise of Christmas Future. It’s a wonderful episode that does a bit of everything I love about Steven Moffat’s era on the show. Matt Smith is as fantastic as ever. There isn’t much Amy & Rory but when they do show up it’s wonderful. Plus, there are flying sharks. 2010 Doctor Who Christmas episode, "A Christmas Carol." Elf. I like Will Farrell but only if I see his name or Adam McKay’s name in the writer/ director credits. If their names aren’t there, I frankly don’t trust it. (Although, I’m normally a Jon Favreau fan.) I wasn’t that interested in seeing Elf but my wife wanted to. So, we rented it one chilly December night. (I haven’t watched it since that night so I’m going off of 10-year-old memories here.) We watched it and laughed quite a bit in the beginning. Then, Buddy the Elf has less and less to do. And the generally uninteresting secondary characters began to take more of the center stage. Then, everyone began learning lessons, which I wasn’t so thrilled with. My wife fell asleep but I was determined to stick it out. I made it to the end but it’s not something I’m proud of. I wish the whole thing had been set at the North Pole. I’d love to see a month of holiday shows from a December past re-created in the TV schedule of a modern December. For example, the Christmas TV schedules of December 1982 reappear, as originally aired, in December 2015. Go back to the TV Guides and schedule evenings accordingly. So, maybe 2 or 3 nights a week, from 8 PM-9 PM, they would show Christmas specials on the same days as the corresponding year from the past. For example, Rudolph on one night (maybe on, say, a Sunday)… then they would show Charlie Brown’s Christmas and Bugs Bunny’s Looney Christmas Tales on Tuesday or Wednesday. And so on and so forth, down the line. Mix in Christmas commercials from the year being mirrored. (Maybe even some local ones if possible.) There you have it. There wouldn’t be specials every night so the network wouldn’t have to devote all their time to this but it would mean that on the nights when they aired it would become more of an event, exactly the way they used to be. I like the idea of a recreated television schedule for the holidays. Even if it wasn't exact - just an evening of classic holiday entertainment - I would be thrilled. Thanks for sharing Daniel. My Christmas isn't complete until I watch John Candy as Divine sing that song! And you're right about the Doctor Who Carol, everything is better with flying sharks. Have you heard this cover version of the song from 'Santa Claus Conquers The Martians'? I really like that Doctor Who special as well. For some reason the annual Christmas episodes haven't been part of my holiday viewing, but maybe it's time to change that this year! 1) That cover tune is awesome. 3) Flying sharks make a Christmas special more special, I think. 4) My suggestion about recreating TV schedules was made mainly so I can get some Dolly Madison commercials back in my life. I do like Christmas in July. Santa Claus Conquers the Martians is so underrated and yet so much fun. I'm not a big fan of Elf, either... although it appears to be big hit with other Christmas movie fans! Also, love the idea of airing past Christmas TV Schedules! Your suggestion for #5--recreate a previous year's Christmas programming line-up--sounds FANTASTIC! I would be all over that! That would be super-fantabulously cool! I was hoping someone would choose Pia Zadora's classic SANTA CLAUS CONQUERS THE MARTIANS! The Doctor Who Christmas episodes are a lot of fun. And flying space sharks DO make that particular ep extra special. I, myself, am partial to "The Doctor, The Widow, and The Wardrobe". I do enjoy "The Doctor, The Widow, and The Wardrobe" too. I thought "Last Christmas" was pretty wonderfully awesome. And, "The Time of the Doctor" was madness but the good kind of madness with tears at the end.